Selection of 252 mainly low value addressed Pre-Decimal illustrated FDC's from 1936 to 1965 including 1937 NSW Sesquicentenary set, 1946 Mitchell set, 1951 Federation set (2), 1952 1/0½d and 2/6 Aborigine, 1953 Coronation set, 1953 Tasmania Sesquicentenary set, 1954 Royal Visit set (3), 1954-55 2/- Blue (3) and 2/- Green (3) Olympic Games, 1955 Cobb and Co set (2), 1956 Melbourne Olympics (2), 1958 2/- Qantas, 1958 5½d War Memorial pair (2), 1959-62 Animals set (2), 1963 Commonwealth Games set (4), 1963 Royal Visit set (2), 1963 2/3 Cable, 1965 Anzac set (6) and 1965 2/3 ICY (4). Odd minor blemish. Very high retail value. Selection of 110 different addressed Pre-Decimal illustrated FDC's from 1937 to 1965 including 1937 NSW Sesquicentenary set, 1946 Peace set, 1946 Mitchell set, 1947 Newcastle set, 1952 1/0½d KGVI and 2/6 Aborigine, 1953 Food strips of 3 set, 1953 Coronation set, 1953 Tasmania Sesquicenetenary set, 1954 Royal Visit set (3½d with Re-entry "Royal Visit", "3½d" etc variety), 1954-55 2/- Blue and 2/- Green Olympic Games, 1956 Melbourne Olympics set, 1958 2/- Qantas, 1958 5½d War Memorial pair, 1959-64 Flower set, 1963 Commonwealth Games set, 1963 Royal Visit set, 1963 2/3 Cable, 1964 Airmail set and 1965 Anzac set. Odd minor blemish and many typed addressed covers. High retail value. Selection of 79 different unaddressed Pre-Decimal illustrated FDC's from 1937 to 1965 including 1937 NSW Sesqui set, 1952 1/0½d KGVI, 1953 Food strips of 3 set, 1953 Coronation set, 1953 Tasmania Sesqui set, 1954 Royal Visit set, 1954-55 2/- Blue and 2/- Green Olympic Games, 1955 Cobb and Co set, 1963 Commonwealth Games set, 1963 Royal Visit set, 1963 2/3 Cable, 1965 Anzac set and 1965 2/3 ICY. High retail value. 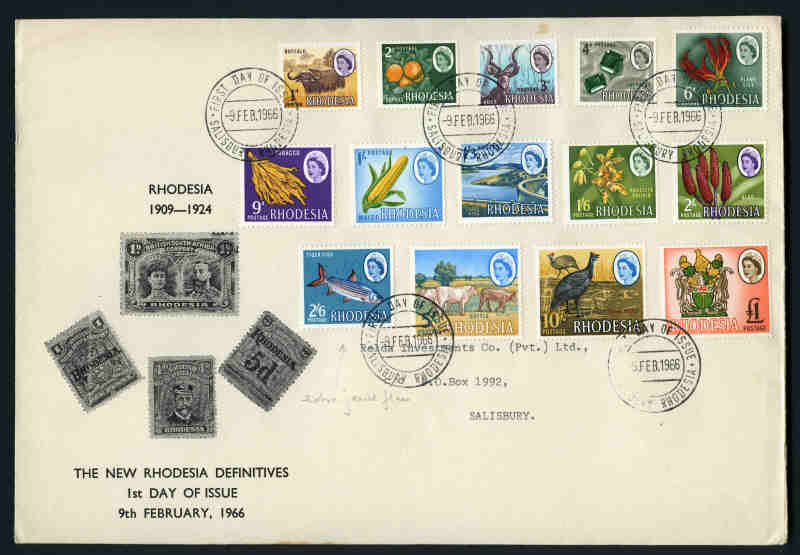 Accumulation of 577 illustrated Decimal FDC's from 1966 to 1976, most issues from 1967 onwards represented by a single, pair and block of 4, plus 76 souvenir covers and postal stationary items from 1966 to 1991. Majority typed addressed WCS covers. Also 78 Papua New Guinea, New Zealand, Tokelau Is and Niue FDC's from 1969 to 1974, plus 30 Papua New Guinea souvenir covers. 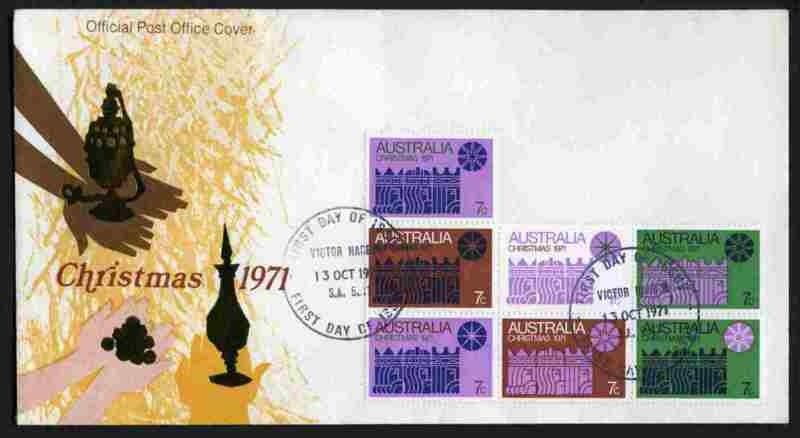 Accumulation of 381 illustrated Decimal FDC's from 1966 to 1980 including 1966 Definitive set of 24 on typed addressed Australia Post logo FDC's (2 sets), plus another set on WCS covers. Majority WCS covers, but includes some Official Australia Post, Excelsior, Parade, Royal and Harbour covers. Some duplication and many unaddressed. Odd minor blemish. Largely complete collection of 66 official unaddressed FDC's from 1970 Expo set to 1974 7¢ Newspaper, including all cover types. Excludes 1970 30¢ Cook small cover only. High retail value. Complete collection of 57 official unaddressed FDC's from 1970 Expo set to 1973 7¢ Radio, including all cover types. Includes scarce 1970 30'c Cook small cover. High retail value. 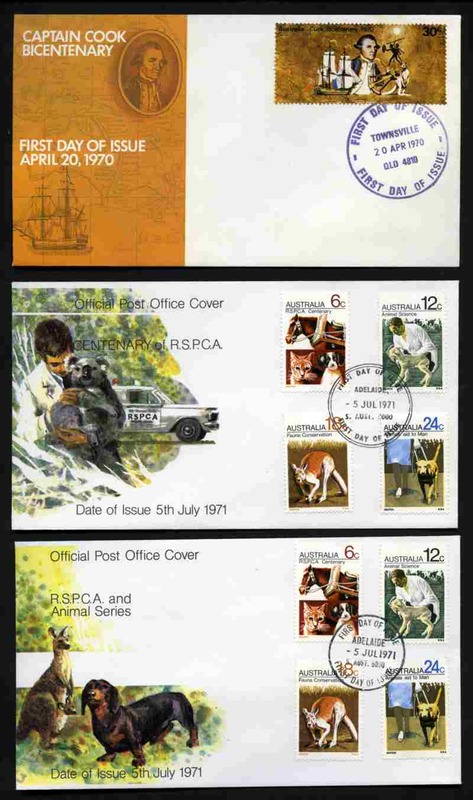 Accumulation of 632 official unaddressed FDC's from 1970 to 1974 including 1970 Expo set, 1970 Cook set (3), 1970 National Development set (6), 1971 RSPCA set (21), 1971 Aboriginal Art set (20), 1971 Christmas block of 7 (3), 1972 Primary Industries set (20), Munich Games set (20), 1972 Christmas set (24), 1973 Famous Aust block of 4 (19), 1973 National Dev set (21) and 1973 Christmas set (19). Hugh retail value. 1971 Christmas block of 7 on official unaddressed FDC. (10). 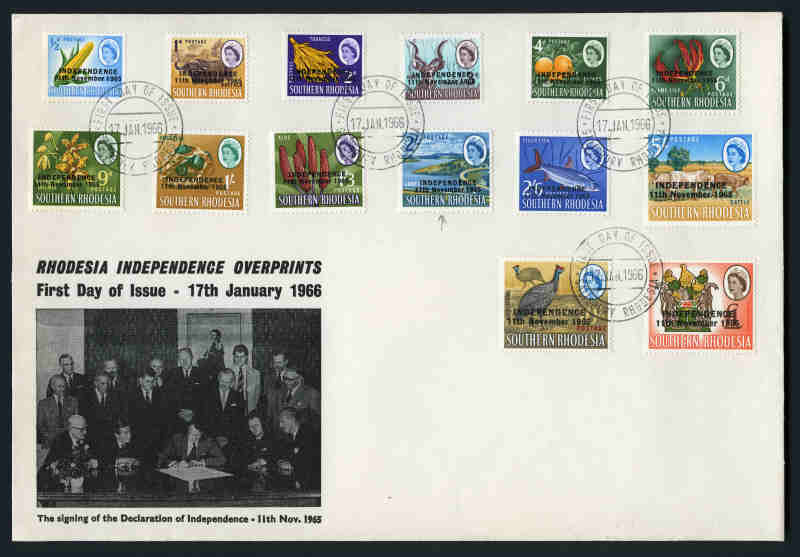 Collection of official unaddressed FDC's from 1974 to 2004, including some Joint Issues and Australian Antarctic Territory, plus range of Pre-Stamped Envelopes, Maximum Cards and few Aerogrammes. Some duplication. Face Value $1,125.00. Accumulation of official unaddressed FDC's from 1975 to 1998, including few Joint Issues and some duplication. Face Value $1,020.00. Collection of official unaddressed FDC's from 1976 to 2008 including Joint Issues, Australian Antarctic Territory, Christmas Island Australia and Cocos (Keeling) Island Australia with some duplication. Face Value $1,363.00. Accumulation of official unaddressed FDC's from 1977 to 1996, most issues represented by a single, pair and block of 4, plus 330 mint and 246 cancelled FDI PSE's. Face Value $3,288.45. Collection of official unaddressed FDC's, largely complete from 1977 to 1992 including Australian Antarctic Territory with a face value of $402.00, range of covers with special and commemorative postmarks with a face value of $78.00, 210 Pre-Stamped Envelopes cancelled on FDI with a face value of $69.00 and 197 Maximum cards. Accumulation of official unaddressed FDC's from 1977 to 2011, including some Joint Issues and duplicates. Face Value $2,387.00. Accumulation of official unaddressed FDC's from 1974 to 1992, including many duplicates. Face Value $1,070.00. Collection of official unaddressed FDC's from 1980 to 2000 with a face value of $890.00, range of covers with special postmarks (face value $144.00) and collection of PSE's from 1980 to 1999, cancelled on FDI with a face value of $164.00. Also range of Aerogrammes, Maximum cards, Postcard packs, Postal Stationery and miscellaneous items. Accumulation of official unaddressed FDC's from 1975 to 2002, including some joint issues and many duplicates. Face Value $1,243.00. 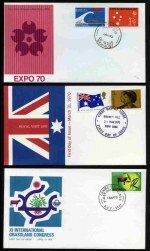 Collection of official unaddressed FDC's from 1975 to 1997, including Australian Antarctic Territory, Christmas Island Australia and Cocos (Keeling) Island Australia issues, with some light duplication. Face Value $976.00. Accumulation of many hundreds of Decimal FDC's, PSE's and souvenir covers from 1966 to 2006, plus range of Pre-Decimal and Foreign covers including few WWII censor covers in wine carton. Some Decimal covers with toning. Selection of 110 FDC's from 1959 to 1985 including many base cancel sets and few Expedition and souvenir covers, plus 38 covers stamped with Australian issues all with base cancellations from 1948 to 1959. 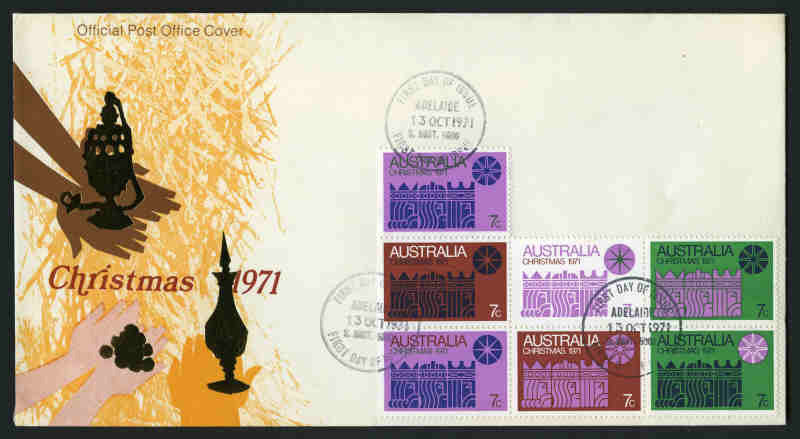 Noted 1973 Definitive set on official unaddressed FDC's cancelled at Macquarie Is, Casey and Davis bases. 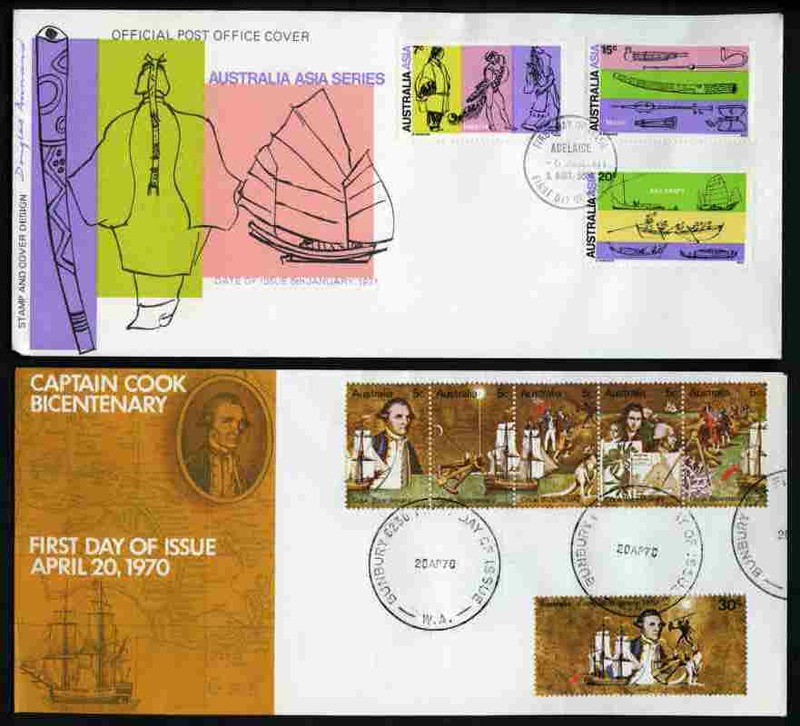 Selection of 312 mainly official unaddressed FDC's from 1968 to 2011, including Australian Antarctic Territory, Cocos (Keeling) Island, Nauru, Norfolk Island, New Zealand, Samoa, Tokelau and Pitcairn Island. Also selection of 72 Norfolk Island PSE's. Some duplication. Accumulation of 279 official unaddressed FDC's, 61 Pre-Stamped Envelopes and 14 Aerogrammes from 1966 to 2003. Odd early cover typed addressed and varying duplication. Odd blemish. Face Value K542.00. 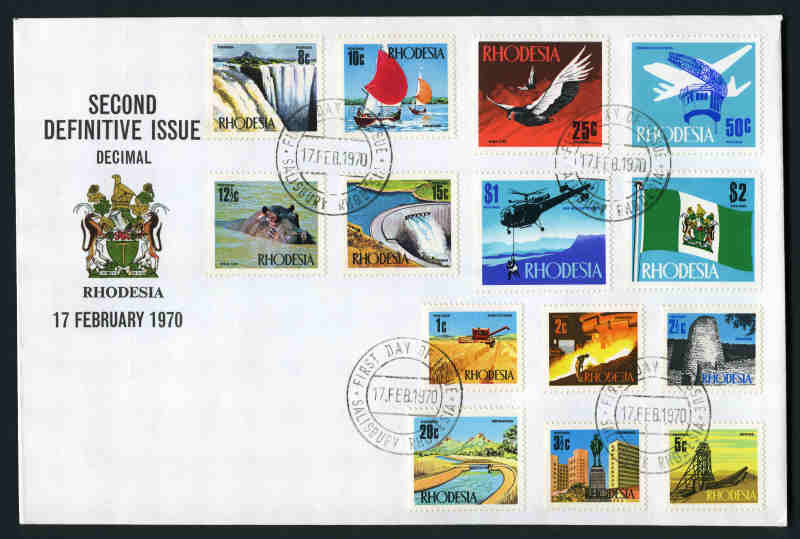 Selection of 193 mainly neatly addressed illustrated FDC's from 1971 to 1993 including 1972 Wedgewood Booklet Pane, the ½d Blue Machin Head with 1 side band and full perfs, High Value Definitives and Regional issues, plus 64 Postal Stationary items. Also small range of 1d Red Queen Victoria covers, Pre-Decimal First Day and souvenir covers and bundle of modern commercial covers. 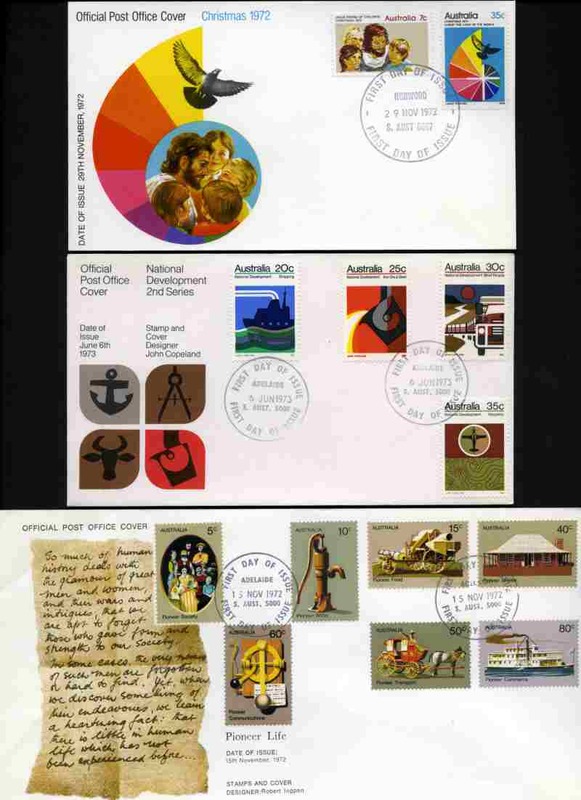 Collection of 186 official addressed commemorative FDC's from 1972 to 1999. Includes several Definitive, Regional and Channel Island issues, plus range of souvenir covers with special postmarks. Majority typed addressed and few with minor blemishes. Face Value £165.00. Collection of official FDC's from 1979 to 1992, mostly with neat typewritten addresses, plus a few Pre-Decimal FDC's. Face Value £157.00. 1972 Silver Wedding, 1977 Silver Jubilee, 1978 Coronation and 1981 Royal Wedding collection of 162 official unaddressed FDC's. Also selection of 33 official unaddressed FDC's comprising mainly Hong Kong, Falkland Islands and South Georgia from 1974 to 2005. 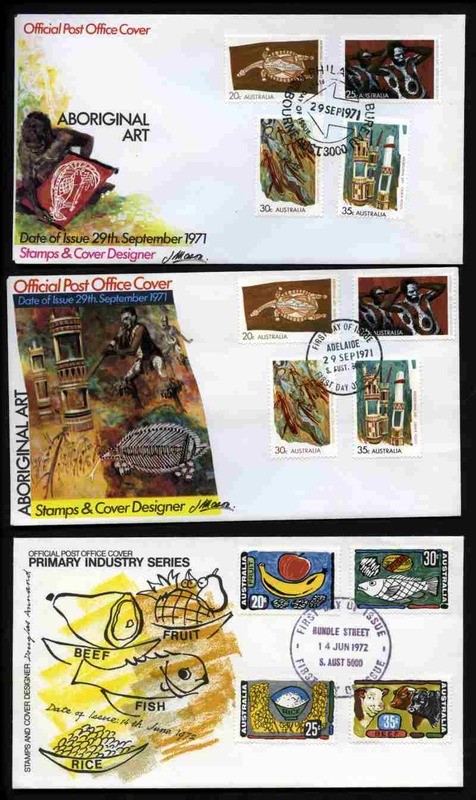 Selection of 300 First Day Covers from 1949 to 1975, with main strength in Australia, including a few commercial covers and miscellaneous items.